Muslim: Why do you Christians have so many versions of the Bible. Which is the actual version? Christian: The answer will surprise many Muslims. There is only ONE version! Muslim: You lie. How can that be? What about the King James Version, New King James Version, New International Version, English Standard Version, etc. Aren’t these all different versions of the Bible? Christian: No. These are not different versions. 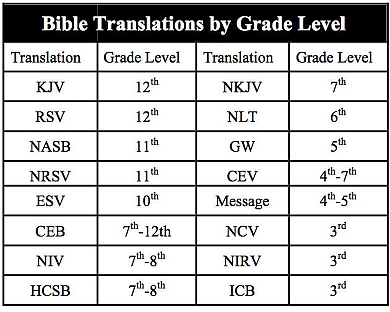 These are different versions of TRANSLATIONS of the Bible. Christian: These are different English translations of the Bible. Not different versions. The message is the same. Different translations of the same message. Muslims: Why the need for so many different translations then? Christian: Good question. The first English Bible used old English. Many words are no longer common usage in our daily language. Muslims: You mean words like “Thou”, “Thee” etc? Christian: Correct. 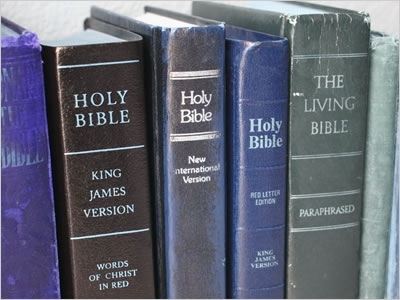 Example, The New King James Version for example, simplifies the English of the original King James version for a more modern reading, substituting words like “Thou” with “You”. The message remains intact but the translation makes it easier to read and understand. Muslim: What about the other versions…I mean….translations… like New International Version? Christian: That’s just another English translation that tells the same message in a way that is easy for most people to understand. There’s even a translation for those for whom English is their second language using limited vocabulary where the message of the Bible is told in very simple English! The goal is simply to communicate the message of the truth of the Word of God. There are more than 2500 translations in hundreds of languages. Do you know there are more than 6000 languages in the world. Bible scholars produce a new translation somewhere in the world every 10 days! Muslims: Interesting. I didn’t know that. But how can you mutilate God’s Word like this? Christian: It’s not mutilating. Nothing is changed or corrupted in the actual message. It’s simply making the Word of God available for everyone to read in the language they understand. Is this offensive to you? Don’t you think someone in Kenya should be able to read the Bible in his own language? Maybe you find this difficult to accept because the Quran should only be read in Arabic. Aren’t you limiting God? The Bible is available in Japanese, Nepalese, Swedish, Indonesian, Hindi…you name it, they have it! These translations are as much scripture as the English translations! Muslim: Sounds like changing the Bible to me…. Christian: No, not at all. Listen. The Quran has been translated from Arabic to English, German, French , etc. Does this mean the Quran has been changed? Does the change in language change the message of Allah? Of course not. Like I said, the message remains the same in every translation even though different words are used. Christian: Do you speak and understand and write Arabic? Christian: That’s not surprising. because only 16% of the world’s Muslims actually understand Arabic. Then how do you read the Quran? Muslim: Haha! I have memorized it since young so I can recite the Quran no problem. Christian: Good. But can you UNDERSTAND what it is saying? Ali: Most of it. Not all of it. Christian: You say the Quran is the word of God for all people, the final revelation to all mankind, yet when you recite it, you dont understand the message of God? How do you expect someone in Iceland to read the Quran in Arabic? They have to first learn Arabic? Muslim: Yes…but they can also read the Quran in English but the Arabic is the only true Quran. Christian: You see, that is one of the differences between the Bible and Quran. God allows the Bible to be translated so everyone can know and understand His message. Does Allah allow that? Muslim: Well, there are translations of the Quran in English and…. Christian: I know. You have many English translations ~ the Yusuf Ali version, the Pickthall version, the Sahih International version, the Shakir version…Are these many different versions of the Quran? Muslim: These are not different versions of the Quran. They are different English translations by different translators…. Christian: Exactly! Different TRANSLATIONS. That means different versions of translations. Not different version of the message…..that’s the same with the Bible…. Muslim: OK. I get what you are saying. Christian: The message of the Bible is the same in whatever translation you use. The only difference is there are different means of communicating that message. For example, the words I use to share a message with you, will be different from the words I use to share that same message with a child. It will also be different from the way I share that same message with my wife, with a stranger, with someone who does not speak English, with someone who is deaf, and so on. The words used may be different but the message remains the same. That is why there are different translations to cater for everyone. Muslim: So which English translation of the Bible should I read? Christian: You can read ANY translation. This chart may help. As you can see King James Version (KJV) might be the hardest to understand for most people. I recommend New Living Translation (NLT) for easy reading. You can go online to BibleHub where you can read the Bible in different English translations that you are most comfortable with. And here’s a link to online Bibles in over 70 languages, where you will probably find a Bible translation in your own native language.